Are you searching for the best mattress store option near Portland, Oregon to find the best deal on a great new mattress? We’ve done some research to help you out. We all know how important a good night’s sleep is for our physical health, mental health, and general well-being. Weight loss, exercise recovery, pain management, even longer life expectancy are all associated with sufficient rest. Of course, experts recommend getting 7-9 hours of rest per night, but most upgrading to a new mattress improves sleep quality and reduces symptoms of stress and back pain. If you’ve had yours for 8 years, are noticing sagging, or are simply waking feeling groggy or stiff, it may be time to replace your old model with a new mattress. Wondering where to buy a mattress in Portland? We’ve got you covered. 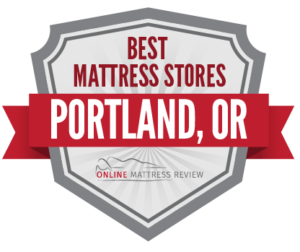 Our review of the best places to buy a mattress in Portland is based on a wide survey of local listings, rankings, and reviews, all grouped by neighborhood. Read on to discover the best place to buy a mattress in Portland, right in your neighborhood. There are quite a few places to buy a mattresses in Central Portland. Of these, two stand out for a high number of five-star ratings: Mattress Lot and Cotton Cloud Natural Beds & Furniture. Cotton Cloud (701 NE Broadway St) is a large warehouse-style retailer stocking comfortable, functional, affordable futons, furniture, and accessories, plus wool futons and mattress toppers. The store is known for natural and sustainable products, including organic cotton, wool and 100% organic latex products, and supports the local community, as well as the environment, though fundraisers and charitable giving. The majority of their materials are locally sourced and most furniture in stock is made in the USA. Mattress Lot (2406 NE Sandy Blvd) is also locally-owned, and sells mattresses made in Oregon and Washington. Natural and organic mattresses are available, as well as an economical “value line” of affordable mattresses which include memory foam, traditional connected coils, and individually wrapped pocket coils. Customers give great reviews to the friendly staff and budget-friendly prices, and the store also offers bike delivery. Nearby, PJ Sleep Shop (1625 SE Hawthorne Blvd) is a spacious mattress store carrying brand-name mattresses and box springs, plus beds and bedroom sets. There’s a wide selection, and the potential to save more when buying mattress and furniture together. Hayden Island is packed with places to buy a mattress, many of which sell furniture as well. BedMart Mattress Superstores (12425 N Starlight Ave), which calls itself Portland’s #1 Tempur-Pedic retailer, has earned a 4.8-star rating on Google and 4 stars on Yelp. Customers praise the store’s staff for their detailed knowledge of the inventory and willingness to work within each customer’s budget. At the Jantzen Beach Center (1337 N Hayden Island Dr) Mattress Pro has also earned a stellar reputation, with 5 stars on both Google and Yelp. This family-owned store specializes in ultra long-lasting, solid latex, 2-sided mattresses, which boast the lowest long-term cost of ownership mattresses in the world because of their longevity, durability, and support. Also in stock is the region’s largest selection of 2-sided, longer-lasting innerspring, pocketed coil, and hybrid mattresses. Customers love the zero-pressure sales experience, and consistently report that the staff aims to steer customers to the best mattress, rather than the most expensive one. Also in the Jantzen Beach Center (2028 N Tomahawk Island Dr), Ashley Homestore has a wide selection of furniture, traditional and adjustable beds, and mattresses. Ashley is the nation’s leading furniture retailer, and stocks name brands in mattresses like Stearns and Foster, Serta, Simmons, and Beautyrest, as well as the store’s own line of highly affordable mattresses. At the Jantzen Beach Mall, Sleep Country (12435 N Starlight Ave) is also popular for offering affordable mattresses, selling name brands like Beautyrest at deep discounts. Mattress Megastore (6800 SW Beaverton Hillsdale Hwy) in the Raleigh Hills is a locally owned and operated mattress shop that promises top selection, prices and service. Customers agree, giving the store a 5-star Google rating, and praising Mattress Megastore’s value and helpful staff. Further to the West, shoppers in search of a particular mattress type can visit Bedtime Mattress Co (7353 SE 92nd Ave) which features custom mattresses made to order to requested dimension, with a variety of fillings and comfort options. Customers love the unparalleled personal service and service and product customization, and appreciate knowing that their mattress has been handcrafted right in Portland. Another option in the South Portland area is Boxdrop Portland Mattresses (4409 SE 24th Ave), which offers affordable mattresses in a warehouse-style setting. Customers give positive reviews to the friendly staff at this small, local business. East Portland is home to a few scattered mattress shops. One of these is Mattress World Northwest Glisan (11930 NE Glisan St), which boasts a 5-star customer rating on Google. This locally owned business gives back to the community by supporting local charities, and is popular with customers for their expert sales staff. Each sales associate works closely with each customer to assess their sleep history, comfort preferences, and habits, and works within their budget to match them with the best mattress. This mattress shop stocks popular, high-quality brands like BeautyRest, Hathaway, and Aireloom, and sells box springs, bases, beds and pull-down beds as well. Another option in East Portland is Mattress Firm 205 Place (9732 SE Washington St) in the McMenamins Mall. This chain store is the nation’s leading mattress retailer, and stocks a broad selection of spring, memory foam, and adjustable mattresses. The store not only allows returns and exchanges within a 100-day period, but will also refund the difference if a customer finds the same product at a lower price during this period. Still another place to buy a mattress in East Portland is Furniture Shack (13120 NE Airport Way), located out near the airport. In this warehouse-style setting, shoppers can score a deal on a discounted mattress, with twin mattresses priced as low as $89 and queen pillowtops as low as $279. In addition to basic models, this furniture and mattress shop stocks gel, memory foam, latex, and foam mattresses. Shoppers in West Portland can visit Parklane Mattresses (536 NW 14th Ave), which has earned an impressive 5-star rating on both Google and Yelp. This locally-owned mattress shop designs and manufactures their own line of mattresses and foundations using superior materials like higher density foam and natural Talalay latex. Their Oregon—based factory and material sourcing are environmentally conscious and sustainable, and the store has been in business for almost 100 years. Factory-direct pricing allows Parkland to sell its high-quality mattresses at very affordable prices, and customers give top reviews to the value and comfort of their products. Nearby, BedMart (206 NW 23rd Ave) also has a solid reputation with shoppers. This family-owned regional chain boasts the largest selection of mattresses in the Northwest, offers both a 120-day exchange policy and free delivery. The store stocks a wide selection of foam, memory foam, latex, hybrid, coil and pocketed coil mattresses.